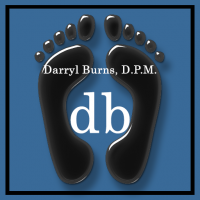 Testimonials - Podiatrist Monterey CA Dr. Darryl Burns, D.P.M. Dr. Burns is the man, my only regret is that I didn’t see him sooner. Had a ton of pain as result of an in grown toe nail. He fixed it without any pain. In and out of his office in 30 minutes. I went to his salinas location. Thanks!! DOCTORS refer patients to him. I had a bunion fixed several years ago and my foot is perfect, like nothing ever happened.